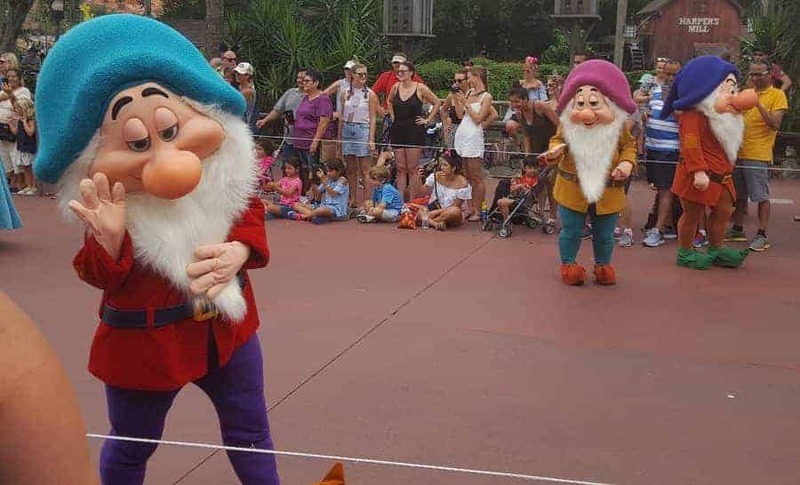 When you go to Magic Kingdom, be sure not to miss their afternoon Festival of Fantasy Parade. This parade is pretty incredible~ full of magical floats and popular Disney music. The parade happens daily and you will want to know some of our parade tips so that you can make the most of your parade experience! If you have children, you will want to make sure that they sit or stand upfront so that they can get the best view and best chance for some personal interaction with characters as they walk by! You will see many of your favorite Disney characters in the Magic Kingdom parade. Some of the characters are on floats, while others dance in the street, and some even come up to wave & hi-five park goers that are seated along the sides of the parade route. The Festival of Fantasy parade route begins in Frontierland and winds its way to Main Street USA. This means that if they parade begins at 3pm in Frontierland, it may take it 10 minutes to arrive at Main Street USA. So while the parade officially begins at 3pm, you may not see it until closer to 3:15 depending how far down the parade route you are. What else do you need to know about the Magic Kingdom parade? 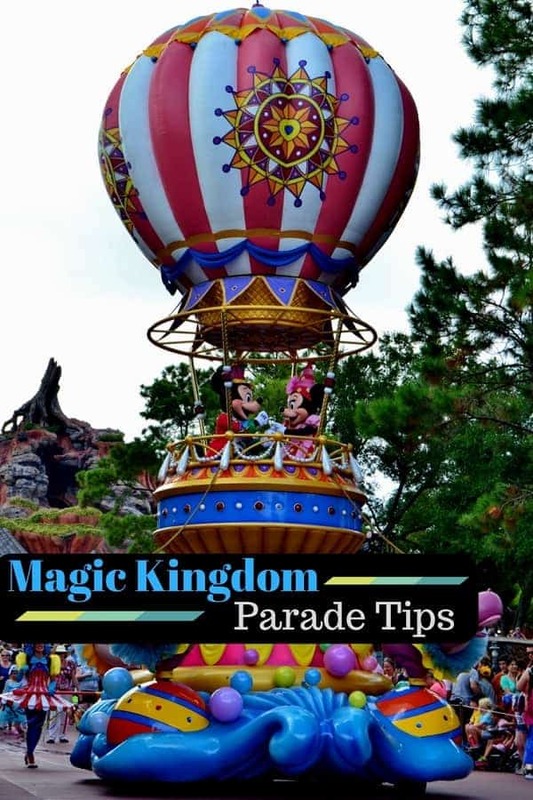 Here are some of our most popular Magic Kingdom parade tips. 1- Get a spot early. While the Magic Kingdom afternoon parade usually starts at 3pm, you will find that people will begin looking for a seat as early as 2pm. Why so early? People know that a premium seat in the shade is very limited. When you have small kids, having them sit in the sun for an hour at the Magic Kingdom can be an event in itself! 2- Find a spot in the shade. My personal favorite place to see ANY Disney parade is in Frontierland where they actually have some bench seating that is right along the parade route! While this doesn’t provide you a front row seat, you do get a decent enough view while remaining a bit more comfortable. 3- Reapply sunscreen. If you are seated in the sun, be sure to reapply your sunscreen! Even if you are in the shade, it is a great time to put another layer of sunscreen on to protect you for the rest of the day! 4- Pack a towel. Kids might be better suited to sit right along the ropes in front of their parents. We have found it helpful to pack a beach towel for children to sit on. Not only does it mark a spot for your kids to sit,it also provides a barrier between the hot concrete and their little legs! 5- Have a snack. While the afternoon Parade at Magic Kingdom begins at 3pm, it will take a while for it to wind itself around to where you may be located. This means that you shouldn’t count on the parade being at your spot at any given time. Waiting for the parade to begin is a great time to enjoy a favorite Disney treat, cold drink or popcorn. You’ll find that there are vendors usually stations throughout the parade route so it shouldn’t be too hard to locate something yummy! Do you have any Magic Kingdom Parade tips to share?